Justice Secretary Michael Gove has ordered a review of the position of thousands of prisoners serving a sentence known as an IPP or Imprisonment for Public Protection. Many are considered to be languishing inside because they are several years over the minimum sentence they were given. James Ward was given a 10-month IPP for arson in 2006. Now nearly 10 years on, he is still inside and has no release date. He regularly self-harms, sets light to his cell, barricades himself in and has staged dirty protests. With a low IQ, and mental health problems, he cannot cope with prison life. His sister, April, fears what he might do next. "I do believe that one day we'll get the phone call that Jimmy has taken his own life, definitely." Now 31, James has been writing to Radio 4's Today programme to explain what life is like for him inside. "I find prison hard to cope with, being trapped in a box," he writes. "Prison is not fit to accommodate people like me with mental health problems. It's made me worse. How can I change in a place like this? I wake up every morning scared of what the day may hold." James' teenage years were troubled. He was in and out of trouble with the police and his parents could not cope with his behaviour. He got into a scuffle with his father, Bill, over the family dog and lashed out resulting in a year in prison for actual bodily harm. But Bill says James regrets what he did. "He's told me it was the worst mistake he's ever made... he was young, he is a nice lad, everybody likes James," Bill says. 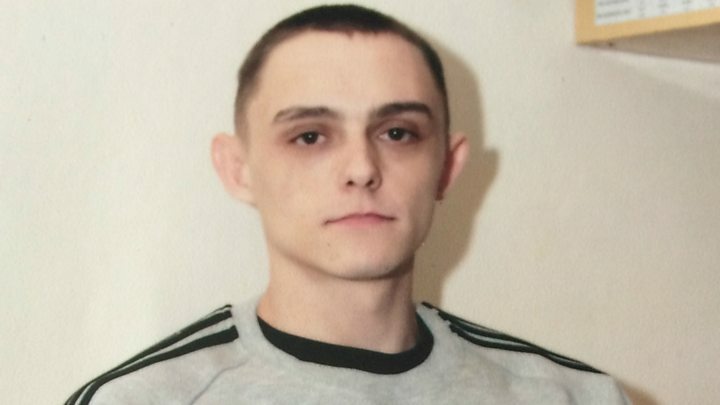 Image caption James' parents Christine and Bill Ward and his sister April described him as "lost and confused"
Close to the end of his year-long sentence, but unable to cope with prison life, James set fire to the mattress in his cell. Because of this, a judge gave him an IPP for arson and told him he would have to serve a minimum of 10 months. That was 10 years ago. Since then, James has set light to his cell several times. His solicitor, Pippa Carruthers, says it is linked to his mental health. "He becomes overwhelmed," she says. "He loses sight of what he needs to do to prove to a parole board that he is no longer a risk and he acts destructively." IPPs were introduced by Labour in 2003. The then-government estimated the sentence would apply to 900 serious violent and sexual offenders but was actually applied far more widely and at its peak 6,000 people were serving the sentence - some for relatively minor offences such as stealing a mobile phone. The sentence was abolished by Conservative Justice Secretary Ken Clarke in 2012 who called them a "stain" on the criminal justice system. But 4,000 people remain in prison and nearly 400 have served more than five times the minimum term they were given. The sentence has been called Kafkaesque as prisoners remain trapped inside because they cannot prove to a parole board that they are no longer a threat to the public. They may have to wait years to get a parole review, or are unable to get on courses to deal with their behaviour. Mr Clarke told Radio 4's Today programme: "It is quite absurd that there are people who might be there for the rest of their lives, in theory, who are serving a sentence which Parliament agreed to get rid of because it hadn't worked as anybody intended. "The trouble is this ridiculous burden on the Parole Board of saying they can only release people if it's proved to them that they're not really a danger to the public. "No prisoner can prove that - you never know when people are going to lose their control, what's going to happen to them when they're released." He added that the key thing was to protect the public by making sure fewer criminals go on to reoffend, through helping them find work and accommodation upon release from jail. Michael Gove has now asked chairman of the parole board Nick Hardwick to review how IPP prisoners are treated. While the justice secretary has said that dangerous offenders must be kept inside, he says he wants the majority of IPP prisoners to be "given hope and a reason to engage in rehabilitative activity". He wants to see the prison population reduced. James' mother, father and sister visited him recently in prison. They said they were worried by his appearance describing him as "lost and confused". The Parole Board has not reviewed James' case for two years and because the system has failed to carry out a required psychological and psychiatric assessment of him, it could be another year before he gets a parole board hearing. He could be in prison for several more years. In his last letter to the Today programme, James said he felt like he was "rotting" in the prison system.